“Transparency, design, traceability, fashion, activism, all of these words reflect the DNA of Centre Commercial,” say Centre Commercial founders Sébastien Kopp and Francois Ghislain Morillion. Seven years after their first location was started in Paris, Centre Commercial has opened a new 100-sq.-meter location on the Left Bank, between Saint Germain des Prés and Le Jardin du Luxembourg, on the famous Rue Madame. 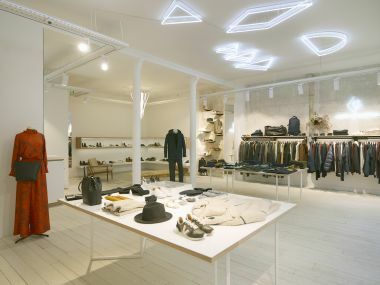 The store’s brands include Veja classics, Bleu de Paname, Patagonia, Norse Projects, Roseanna, Suzie Winkle, A Kind of Guise and Common Projects to name only few. What all these brands have in common is the transparent production of the collections. Seven years after the first location was started in Paris, Centre Commercial has opened a new 100-sq.-meter location. Your first store is very well known internationally. Why was it time to open a second store? Or was it just an opportunity? Centre Commercial was created seven years ago. We decided to gather all cool brands with transparent sourcing and that had a special care with production–Made in France, England or US brands that work with ecological fabrics. The shop grew up very well. Today, we are a team of 20 people. We found a new space one year ago, on the other bank of the Seine, in Saint Germain des Prés, an eternal area of Paris. We wanted to add our touch in this area, which you can compare to SoHo in NYC. A lot of our clients were asking for it. You said that the location of the store on the Left Bank is a big challenge, as the public in Saint-Germain is particularly demanding. Why? It is a big challenge because we opened in a neighborhood that is a little “deserted” by brands unlike the Marais. We are coming humbly with the desire to electrify the district while respecting its heart and soul. The selection will be slightly different to adapt it to this new area. What do you like about your ’hood and your customers? Our customers are very different, that’s what we like. Our customer can be a man or woman 25 years old or 55 years old. There are no rules and that’s what we love. We have a lot of couples who come to our shop and shop together. The store’s brands include Veja classics, Bleu de Paname, Patagonia, Norse Projects, Roseanna, Suzie Winkle, A Kind of Guise and Common Projects to name only few. Transparency, design, traceability, fashion, activism. These words reflect the DNA of Centre Commercial. This shop offers a premium selection and chooses its brands with great care. Products are all responsibly manufactured and you can find labels that read Made in France, Organic, Certified Sustainable, etc. It’s a place that combines fashion, design and sustainability, and houses incredible projects that nobody believes in. To help promote its projects, Centre Commercial regularly hosts events and collaborations. In total, more than 40 events have taken place in the shop’s first seven years. These receptions were meant to create a community for the concept store’s following. That’s why for us Centre Commercial is different. For Centre Commercial, rue Madame: it is a very high ceilinged space, designed by our studio. We used new materials such as micro-mosaic made out of recycled computer and TV screens or French grown oak wood. We try to design the architectural project as we design all our projects: well-made raw materials mixed to an edgy design. All the lights have been designed by the neon artist Kleber Matheus, who designed neons chandeliers. Everybody was impressed by them. When we launched the store more than 1,000 people came to celebrate with us, it was a very emotional moment for the team. All brands have in common is the transparent production of the collections. We selected brands for men and women that concentrate on two main characteristics: edgy aesthetics and transparent sourcing. There are institutional brands such as Patagonia, Paraboot and Church’s, with a curation of their collections. Then there are newcomers that brings their freshness, innocence and crazy energy such as Proemes de Paris or Avnier. We designed this store to be a springboard for the designers of our generation. For us fairs are important. They allow us to discover and follow brands and fashion. We are going to Man/Woman, Première Classe, Capsule and Revolver. Adaptation! To the client or new trend! How important is digitalization for you? How does it take place in your stores and on the sales floor directly? Digitalization is more and more important. Our website is working better and better and many of our customers are buying from around the world. The next Centre Commercial’s project, since the opening of our new shop in early December, is to redesign our website so it’s more enjoyable for our customers.